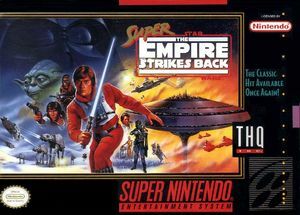 Pursued across the galaxy, and your Rebel Forces now marshall new strength on the remote ice world of Hoth in Super Star Wars: The Empire Strikes Back. Although tracked by probe droids, attacked by ice monster, and confronted by an army of gigantic Imperial Walkers, you must not give in. You are the Alliance's only hope. Learn the ways of the Force, then test your skills in this fast-paced, action-packed sequel to the high game, Super Star Wars. The graph below charts the compatibility with Super Star Wars: The Empire Strikes Back since Dolphin's 2.0 release, listing revisions only where a compatibility change occurred. This page was last edited on 21 February 2018, at 05:03.